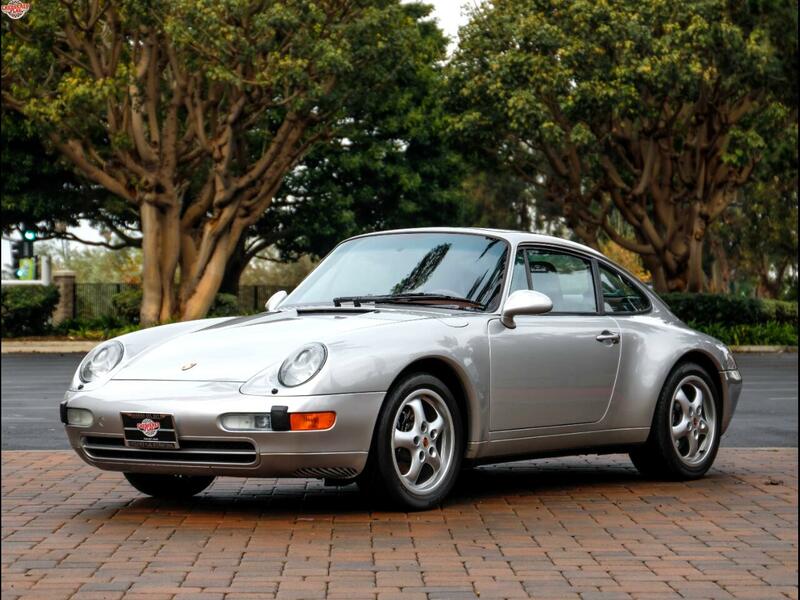 Chequered Flag International is pleased to offer this 1997 Porsche 993 C2 6 Speed Coupe in Artic Silver with Chestnut interior. 20,378 miles with clean Carfax with nine odo readings, which is good for a very low mile car. Absolutely perfect body with fantastic original paint (see meter readings below). All stickers in place including option code sticker under the hood. Incredibly superb interior. No redyed seats, no dash cracks, absolutely fresh, original and perfect - looks like a 10k mile car. Mechanically superb and a delight to drive. No smoke on start up, lots of power, great gearbox with perfect shift, excellent syncros, clutch is spot on. All windows, A/C, seats, and sunroof work well. New Bridgestone Potenza Pole Position tires just fitted. New hood and deck lid shocks. Well optioned with: Limited Slip Diff, Motor Sound Package, Dark Rootwood Shifter/Brake, Power Seats, 17" Cup Wheels, etc. Comes with Certificate of Authenticity, original books including maintenance book with option code sticker, jack, tools, air pump & both keys. You want one of these - a C2 Coupe is the one to have, stick of course, colors are important, Silver is good, Chestnut interior is fabulous! These are good with miles but get in a fresh super low mile example and you'll understand what the differences are. This one really ticks all the boxes. No need to ever sell this one! Inspections encouraged. All sales AS-IS. Sales tax and license fees due if delivered in California.